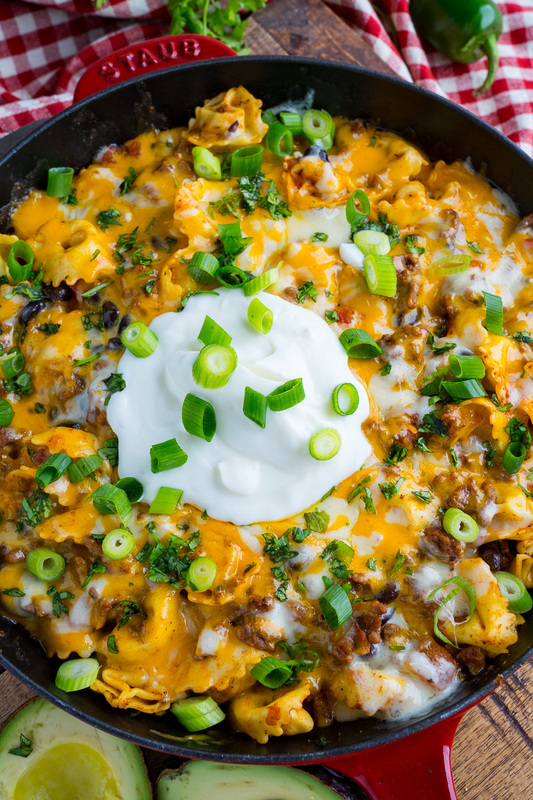 A quick, easy and tasty beef enchilada skillet covered in melted cheese! 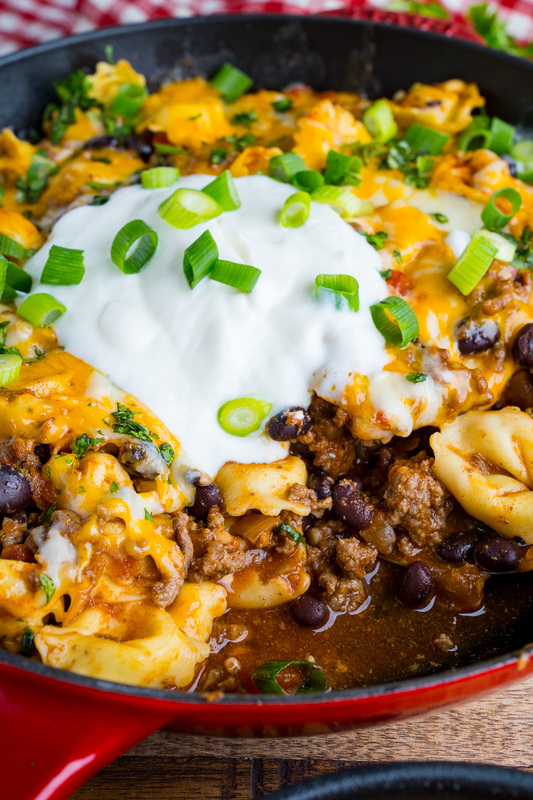 Today I have a cheesy beef enchilada tortellini skillet recipe to share and it’s quick, easy, hearty and packed with flavour! 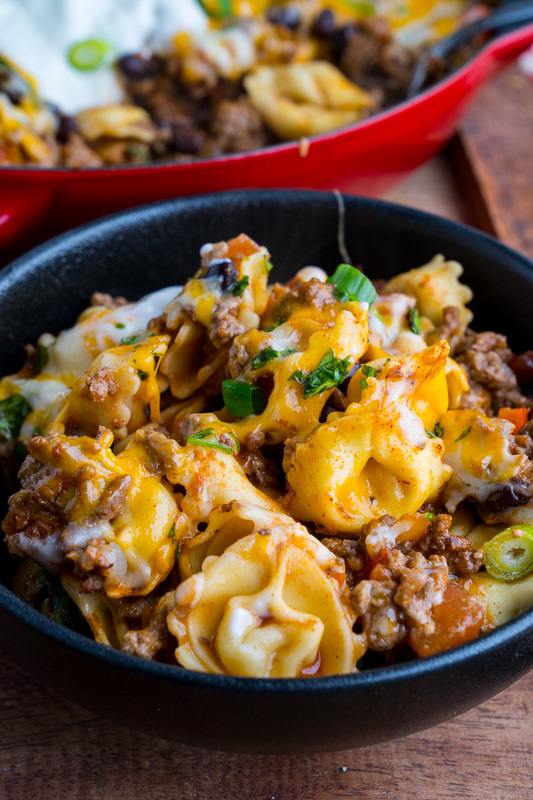 While you are waiting for the water to boil to cook the tortellini, you cook some ground beef, add taco seasoning, add enchilada sauce (or salsa) along with your favourite enchilada ingredients like beans, corn, etc. before adding the tortellini, covering with cheese and baking until the cheese has melted! Yum! It’s hard to resist these enchilada flavours, especially when covered in melted cheese and topped with sour cream! 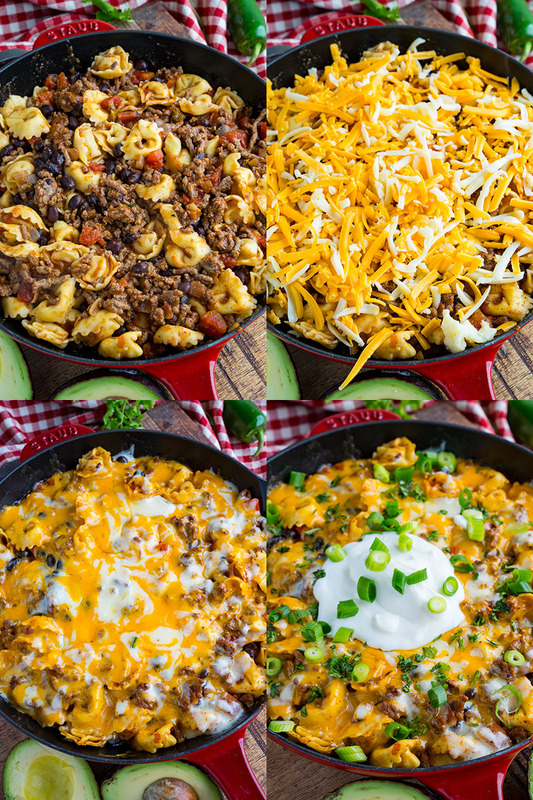 This skillet dish makes for the perfect weeknight meal that everyone will enjoy! Start cooking the tortellini as directed on package. Meanwhile cook the ground beef in a large skillet before draining any excess grease. Mix in the seasoning followed by the water, enchilada sauce, the tortellini, beans and corn into the beef and bring to a simmer. 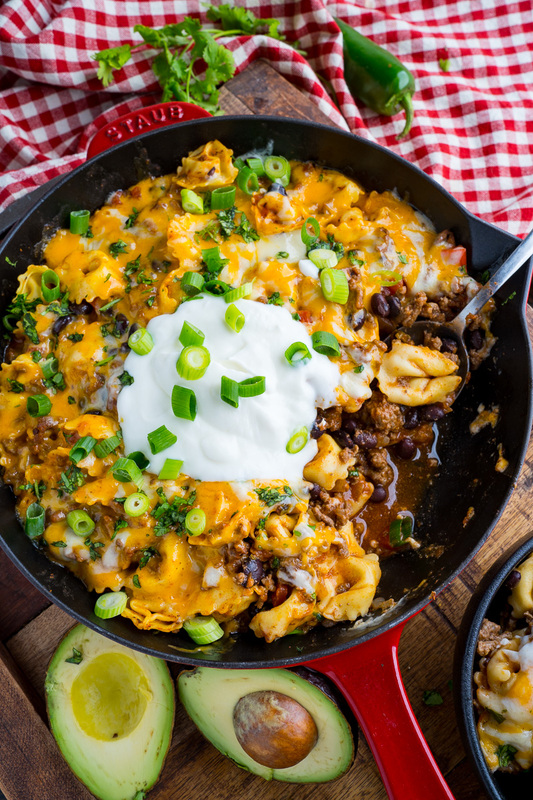 Top with the cheese, place under the broiler until the cheese has melted, about 2-3 minutes, before topping with sour cream, green onions and cilantro and enjoying! I can’t resist a Mexican dish and thus looks amazing. Pinned! Hi Kevin, Loving trying out your food ideas. Thanks so much. I hope the Blueberry Recipes book arrived okay. We made this dish and it was a ton of liquid. It looked like a soup after following the directions. Is there something missing from these directions? Thanks! Same!! I added more tort pasta to try and soak it up. I’ll make it again but cut back on the liquid for sure. Awesome concept, recipe just needs tweaked!